Here you can experience a farm as it looked at the turn of the century, stroll among the hay fields and hundred-year-old oak trees, enjoy the nature and look at the animals. There’s also part of a small town with a square, temperance lodge and a restaurant that you can visit. Just like in the rest of the park, all children can play to their heart’s content in Katthult. There is a winding brook here that flows into a shallow lake, a play barn, an earth cellar that you can crawl into and last but not least Emil’s own woodshed, complete with his collection of wooden figures. And as everyone knows who’s heard the stories about Emil, this is a place he often visits. 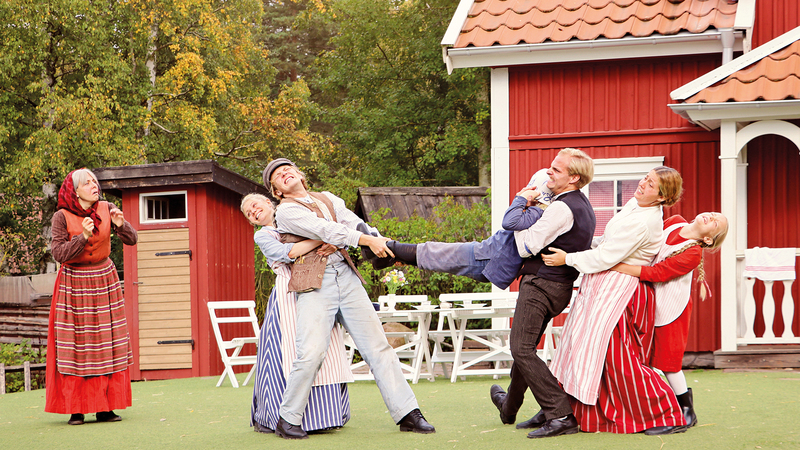 In Katthult you can see, among other things, ‘När Emil körde huvudet i soppskålen’ (When Emil got his head stuck in the soup tureen), which is performed from the start of the season. Between the performances, you can meet Emil and his family. The question is which is more fun: watching Emil get up to mischief or joining in when he does? The daily programme and our app show the times when Emil and his family are at home in Katthult.